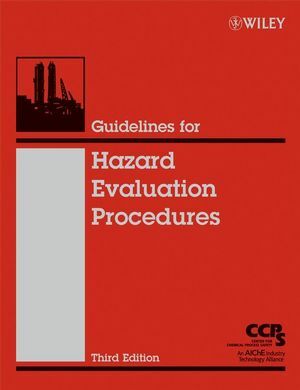 Guidelines for Hazard Evaluation Procedures, 3rd Edition keeps process engineers updated on the effective methodologies that process safety demands. Almost 200 pages of worked examples are included to facilitate understanding. References for further reading, along with charts and diagrams that reflect the latest views and information, make this a completely accessible work. The revised and updated edition includes information not included in previous editions giving a comprehensive overview of this topic area. Since 1985, the Center for Chemical Process Safety (CCPS) has been the world leader in developing and disseminating information on process safety management and technology. CCPS, an industry technology alliance of the American Institute of Chemical Engineers (AIChE), has published over 80 books in its process safety guidelines and process safety concepts series. Part I: Hazard Evaluation Procedures. 1 Introduction to the Guidelines. 2 Preparation for Hazard Evaluations. 4 Non- Scenario-Based Hazard Evaluation Procedures. 5 Scenario- Based Hazard Evaluation Tech. 6 Selection of Hazard Evaluation Techniques. 7 Risk- Based Determination of the Adequacy of Safeguards. 8 Analysis Follow- Up Considerations. 9 Extensions and Special Applications. Part II: Worked Examples and Appendices. Preface to the Worked Examples. Management Overview of the Worked Examples. 10 Introduction to the Worked Examples. 11 Description of the Example Facility and Process. 12 Hazard Identification for the Example Process. 13 Research and Development- What- If Analysis. 14 Conceptual Design- Preliminary Hazard. 15 Pilot Plant Operation- HAZOP Study. 16 Detailed Engineering- Fault Tree and Event Tree Analysis. 17 Construction/ Start-Up - Checklist Analysis and Safety Review. 18 Routine Operation - Safety Review for Management of Change. 19 Routine Operation - HAZOP Study for Cyclic Review. 20 Plant Expansion- Relative Ranking and HAZOP for a Batch Process. 21 Incident Investigation- FMEA and HRA. 22 Decommissioning - What- If/ Checklist Analysis.